In that spirit, three examples of entrepreneurial thinking fostered by DAI-led projects have recently won acclaim: a gas cylinder safety and tracking device in Jordan; therapeutic sensory spaces for children with developmental disorders in the West Bank and Gaza; and a mobile application for tracking complaints registered with governments in Cambodia. Layth Hamad, far right, the top prize winner in the country's first-ever Maker Competition, shows his invention to onlookers. The Clev-G tracks gas readings online and notifies users when their gas cylinders—commonly used for cooking and heating—are nearly empty. In Jordan, Layth Hamad, the top prize winner in the country’s first-ever Maker Competition, has received coverage from Al Jazeera and other news outlets for his project, Clev-G, which tracks gas readings online and notifies users when their gas cylinders—commonly used for cooking and heating—are nearly empty. 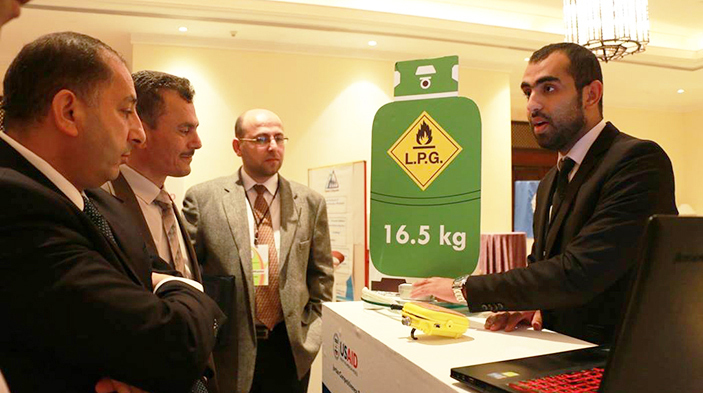 It features a fire and gas leakage alarm that aims to mitigate one of the leading causes of home fires in Jordan. Hamad, who is 23 years old, was mentored under a Youth Entrepreneurship Training program given by USAID’s Jordan Competitiveness Program (JCP). He later joined JCP’s Intel Galileo Development Boards Program, which gave him hands-on experience in electronic design and qualified him to enter—and win—the December 2015 Maker Competition, which featured 22 teams and 50 participants. Clev-G is already receiving investor interest thanks to the coverage, which was prompted by a JCP social media campaign. These environment-controlled spaces allow therapists to become closer with patients—typically children with developmental disorders such as autism, post-traumatic stress, and hyperactivity—through a combination of special lights, music, visuals, and toys, thus increasing the chance for successful therapy. Fifteen Sensory Rooms, which cost $20,000 each, have already been installed in the West Bank and Gaza. The U.K. Department for International Development (DFID)- and European Union-funded Palestinian Market Development Programme and the U.S. Agency for International Development (USAID) Compete Project both assisted Iris in reducing the cost and making the product more convenient and portable (the Sensory Box costs $3,500). Iris is working on rolling out the product in autism clinics in Jordan, Saudi Arabia, and the United Arab Emirates and has attracted several investors from the region. The company will participate in the 1776 Challenge Cup global competition in June in Washington, D.C. In Cambodia, the Transmit mobile and web application—for tracking complaints registered with local governments—was recently featured in Forbes.com. The app, developed with assistance from USAID’s Development Innovations (DI) program, enjoys fortuitous timing, with the Cambodian prime minister vowing earlier this month to utilize social media throughout the national and local governments to respond to and address public service issues. Transmit allows government and grassroots leaders to enter complaints made by citizens during community council meetings to an online database, where government officials can address them and indicate their status. “The [goal] is to improve responsiveness and downward accountability of local government to the Cambodian citizens,” Zach Center, country manager of Pact, the nonprofit organization behind Transmit and a DI grantee, told Forbes. The Transit tool is one of a series of pilots developed by DI and its Cambodia-based partners to test whether digital innovations can improve the reach and efficiency of their organizations.